Checkin is a popular feature of internet’s social networks, to share with our connections latest places we’ve visited. As we hope Domus to be an interesting place, we’ve added a checkin extension, which allows anyone with a smart phone to share the news. A QRcode with the appropriate link is placed nearby the entry of Domus, and let people share interest of their visit with their friends. The version under development uses the same principle in order to authenticate people within Domus. As Facebook let us know who have been checked in recently, we can use the identity of the checker to allow/refuse entry, or to load user preferences (thermostat setpoint settings, scenes, schedule, favorite music and movies…). A dual-way authentication is also considered. Skype is a popular communication tool, which *limit* is only to connect only people together. Using Skype Java API and an Alice Bot, we broke this limit. Console: the chat windows within Skype is used as an OSGi console, for command inputs and log output. Bot: associated with an AIML interpretor, an human level conversation can be engaged. Below is a video capture of the party result. Party button paradigm was first introduced by Zackary Anderson, student at MIT, as a demonstration for its MIDAS system. The same concept was taken to develop a specific “party” scenario within Domus. 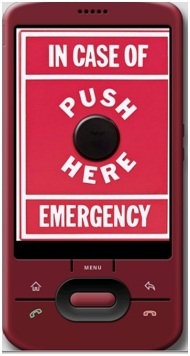 An emergency button has the advantage to be irresistible, even though consequences may be regrettable. But not only a physical button can trigger this scenario, but also the entire abstraction system. Thereby, the “party” mode can be triggered from an HTTP REST request, a smartphone (using OpenRemote), and even Skype. But a particular kind of people can “come and spy” from time to time in this uninhabited plateform. We denote these people as intruders, and have enhanced the apartment with capabilities to recognize these people, and to defend itself (meaning defending the privacy of the Domus Team). We used OpenCV with the entry door camera, running face recognition on a server. If an intruder is detected, the door locks once the intruder is inside, and the apartment plays Finish death metal for one hour. Dynamic lighting is rather complex to manage, controlling colors and cycles at the same time. Existing tools and devices dedicated are usually made for professionals and hard to use for regular people. Using previous projects knowledge, we decided to develop a tangible interface in order to control such lighting. This developments have been presented at the KNX 1010 Scientific Conference. As part of some “Social Web of Things” prospective research, we found interesting applications. We wanted to create our own intelligent object, a common use artifact enhanced with non-intrusive intelligence, and able to express itself using a Facebook page. Inspired by developments made by the Middlesex University, we decided to enhance a beer pump. A relay, to switch on and off the refrigerator of the beer pump. All these physical components are integrated within a middleware, which has an exclusive connection to an application server. 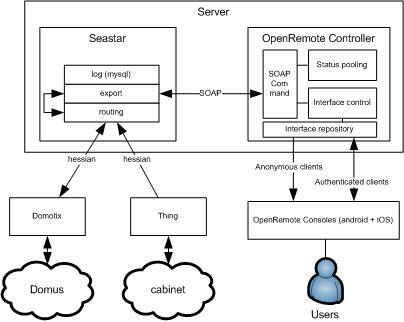 This application server redirects and record data from the sensor to Domus. This design allows the beer pump to be connected in different IP network, making possible to bring the “thing” almost anywhere. The software architecture is described in the following figure. In addition to the connection with Domus, the application server can export data and import commands using a RESTful interface or a SOAP web-service. We used this ability to create a connector with the OpenRemote solution. OpenRemote is a great Open Source project to build user interfaces for iPhone and Android devices, handling many home automation protocols. We proposed SOAP as one of these protocols. As OpenRemote handles authentication, it allow non-authenticated people to simply monitor the temperature from a smart phone, and authenticated people (meaning the Domus Team), to lift up and down the whole thing. This hack was developed for the KNX 20st anniversary contest, in which KNX Association asked to its dear members to propose a video for this event. It uses the TangiSense device, developped for the IMAGIT project, which is drived by Domus itself. It consists in a KNX RF button, which when is pressed, starts a scene as shown is the following video.